I craved cupcakes the entire time I was working on these pages! Actually, I needed a break from working on one of the more difficult quiet book pages and decided to begin working on the cupcakes instead. I hand drafted the cupcake cup and top taking my page size into consideration. My page is 8.5″ square, so I decided I wanted 9 cupcakes at 2″ tall each. I made the cup 1″ and the cupcake top 1″ tall, and they are approximately 2.5″ wide. For the cupcake cup pieces, I just sewed them onto the page using wonder tape to hold them in place. Of course I ended up sewing them on at a slight angle, but they’re all at the slight angle! 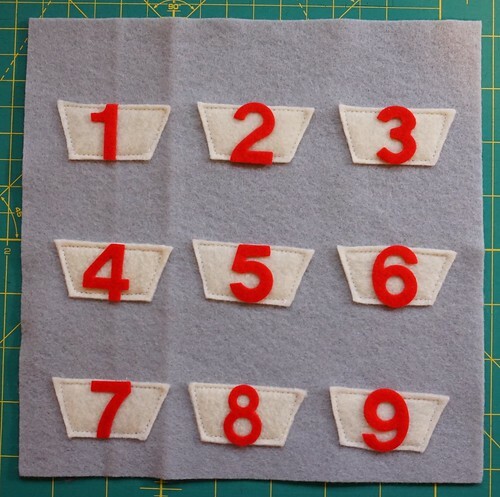 I had some sticky precut felt numbers on-hand that I had picked up from my local craft store, and they just fit. I was happy because I didn’t feel like hand stitching the numbers on! I like their big, bold look too, and the way they stand out against the plain background. If they come loose, I think I’ll just hot glue them because they’re not meant to be sewn through. 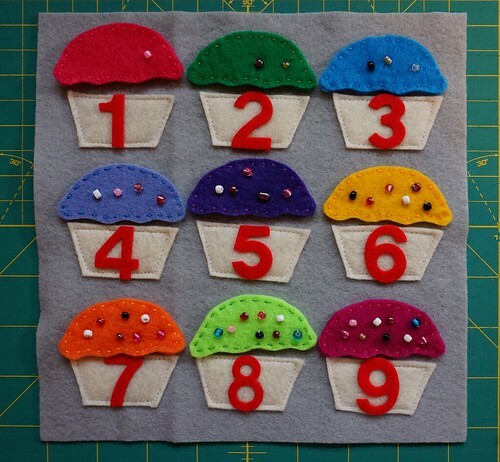 The cupcake top pieces are doubled up felt. I hand sewed the beads on to correspond with their cupcake numbers, then I hand stitched them together using 2 strands of embroidery floss. I’m relying on the fact the tops are felt to keep them on the felt page and didn’t want to use snaps or hook and loop tape. 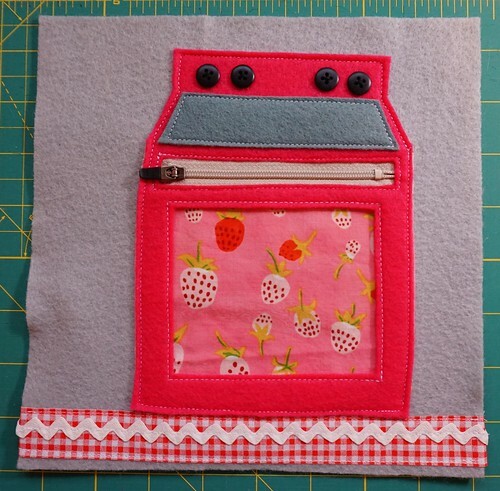 To store the cupcake tops I added a cute oven pocket. I spent some time deliberating on how I was going to make this. I mean, if it’s not fun to open and store cupcake tops, then what’s the point, am I right? I searched for inspiration amongst other oven quiet book pages. There are so many variations, but I found my favorite on Catch My Party. I hand sketched the oven pretty quickly. I decided to use a zipper as the oven handle, and I used some scrap fabric for the back of the oven. I wish the back of my oven had this print on it! Then I used clear vinyl so she can see the cupcake tops in the oven. To assemble it, I basically just cut out the sections inside the oven felt piece, then I sewed the gray oven top piece on, followed by the clear vinyl in the back, then the zipper, in that order. 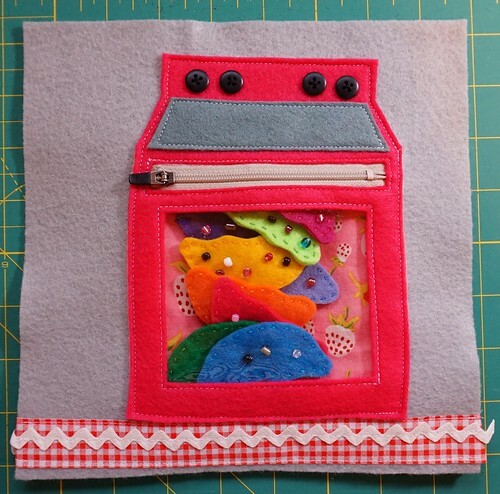 I placed the fabric piece underneath, then stitched all around the oven onto the felt page. I’m very happy with the way it turned out, except for the wonky angle, but oh well. On to more quiet book pages! Very cute. My granddaughters will enjoy this one. 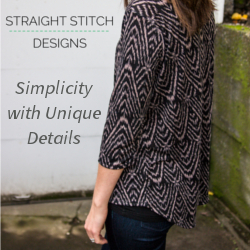 Thanks for sharing your sewing skills.